George Doddie Weir, Scotland Rugby legend and former British and Irish lion has confirmed that he has motor neurone disease. The 46 year old who earned 61 caps between 1990 and 2000 for Scotland made the announcement on Twitter. His revelation came on the heels of the Global MND Awareness Day and he announced his diagnosis in order to raise awareness of the disease. Posting on Twitter, he wrote:“something I think you should know” and added a link to the Euan MacDonald Centre, a Scotland-wide research initiative with its base at the University of Edinburgh, one which Doddie has pledged to support. 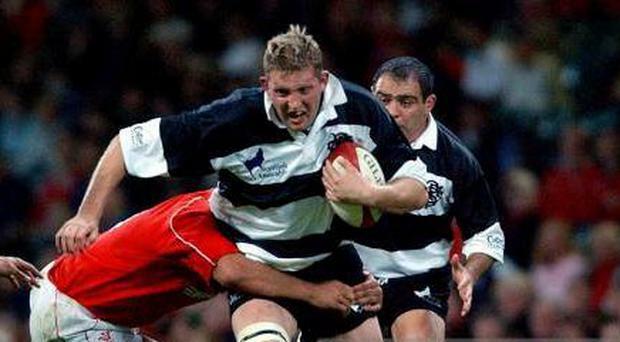 Doddie Weir said: “Over the past few months a number of friends and family have raised concerns surrounding my health. He further went on to thank the National Health Service in recognising and diagnosing it as yet an incurable disease. In the World Cup Finals of 2003, Martin Johnson had become famous for leading England to their victory against Australia. Johnson is expected to be in Lincolnshire on March 2. The England Rugby legend will on that day, join Duckworth Land Rover in celebrating the opening of its brand new showroom in the area. The showroom houses both Jaguar and Land Rover. The special launch event has about 650 guests invited to witness the opening of the new Kirton showroom. The hosts are still putting a number of finishing touches to the new Jaguar showroom worth no less than £7 million. The former Japanese coach and the current England rugby union coach, Eddie Jones, is a confident man. He says that he sees England toppling the world champion All Blacks side at the 2019 Rugby World Cup to be held in Japan in three years time. Under coach Jones, Japan came into the limelight by defeating Springboks in the 2015 Rugby World Cup. They parted ways after the World Cup in England and now Jones is the coach of the England rugby team. Jones has been instrumental in the kind of turnaround that the England team has showcased of late. They have won the Six Nations Grand Slam and also beat the mighty Wallabies in the June tests under his coaching. There is no doubt that he is one of the top international rugby coaches of this modern era. Stuart Lancaster, the 45 years old Head Coach of England National Rugby Union team still thinks that his team still is capable of becoming the champion of Six Nations Rugby notwithstanding the fact that his team has lost the match against Ireland on Sunday, 1st March and along with it all the hopes of winning the Grand Slam. It has been 12 years since England Rugby team managed to win Grand Slam. On Sunday’s Match, the England Rugby team managed to score only 9 points while their opponent, Ireland’s score was 19.